Summer Squash cooked in a little bacon fat with lots of onion and a little thyme or tarragon. This is one of the most delicious ways to eat squash. Summer squash is plentiful in the south during July and August. I much prefer it to zucchini. It has a natural sweetness and pan frying it brings out even more sweetness. Fresh yellow crookneck squash are so tender and delicious, especially the smaller ones. 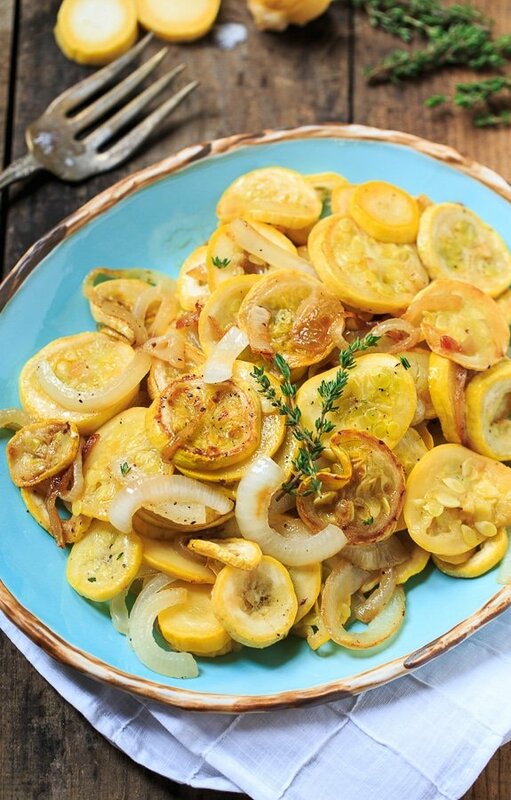 Summer Squash and Onions is a simple dish with plenty of flavor from bacon grease and onion. If you wanted to make this vegetarian, you could leave out the bacon grease and use more butter or olive oil. I like to add just a little dried or fresh thyme for some herb flavor. Basil or rosemary would be good too. If you’re trying to find more vegetable dishes your kids will eat, try this one. Kids love the sweetness. If they don’t like onions, just remove them before serving. 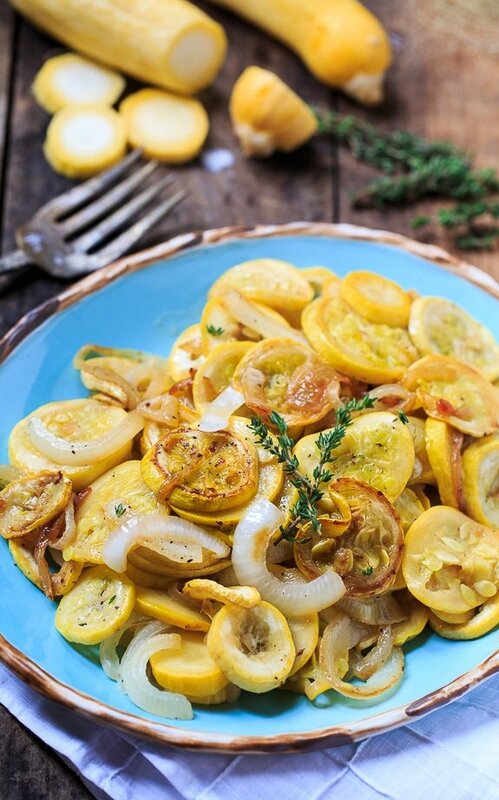 Summer Squash and Onions is an easy summer side dish flavored with bacon. Pan frying the squash really brings out its sweetness. In a large pan, preferably cast iron, heat bacon grease and butter. Add squash and onion. Sprinkle sugar over squash and onion. Cook over medium-low heat for 20 minutes, stirring occasionally. Stir in salt, pepper, and thyme and serve. This entry was posted in Side Dishes and tagged squash, summer. Bookmark the permalink. Just made this for dinner. I am loving the flavors without the bacon fat! Just added more butter and olive oil. And the children Liked it!! When I first tried this recipe I didn’t have any bacon grease. I just added a tablespoon more of butter. The recipe turned out to be very tasty and delicious. The second time I made this I followed the recipe and used bacon grease. Although very good, I prefer the recipe without bacon grease. 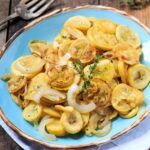 I love squash and onions together and wanted to try a new recipe. This was tasty, but really felt the bacon grease overpowered the vegetables. My mother ALWAYS fixed squash this way. She grew up on a farm and her parents had a huge garden. If there are leftovers, keep frying until brown. DELICIOUS !!!!! The perfect summer recipe! I love that this is cooked in bacon fat too.. I bet it adds such a rich and delicious flavour. I love cooking with bacon grease! 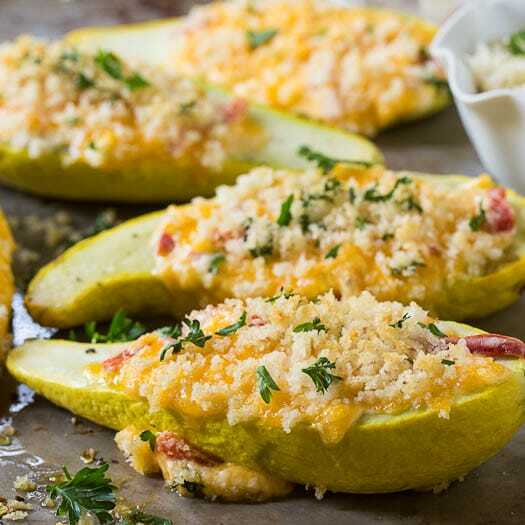 This is such a great way to add flavor to a summer squash dish. I’m now regretting passing on the squash at the grocery store this past weekend. What a great way to eat squash! It really looks very delicious. So delicious and great with the bacon happiness and onions… Almost like a complete meal. OMG YES! I for a second thought that was mac & cheese, but NOPE it’s 10x better and 10x healthier! I love how healthy this dish is! The squash looks beautiful and perrfect for summer! 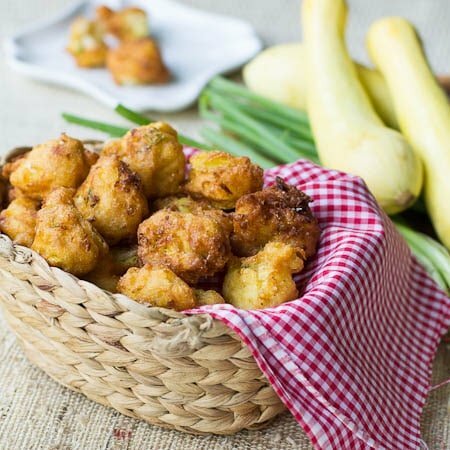 This sounds like a fabulous way to make summer squash! I always have bacon fat saved in my freezer! This is such a great way to give some squash flavor! I love the onions in here too. Sounds like the perfect side dish! Yummm I love squash. This looks perfect! What a delicious summer side! 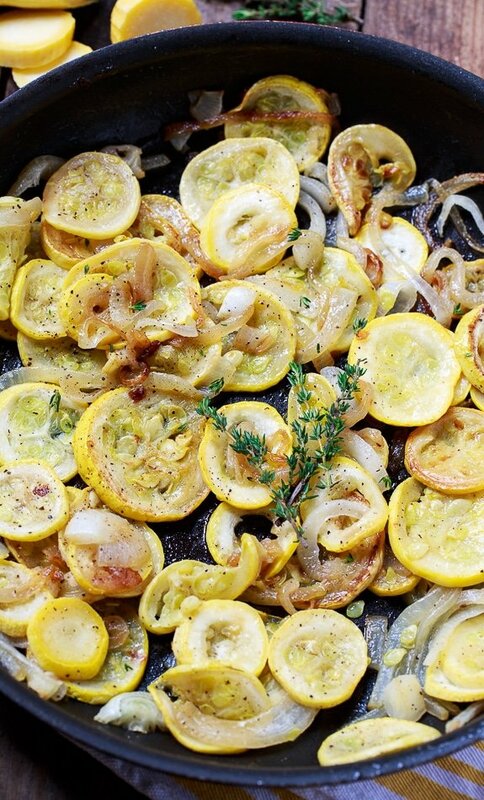 I love summer squash and onions together – looks so good! Have a great weekend! I love that you used just enough bacon fat for that extra flavor, I bet this could get even my husband to eat squash. What a great recipe, I’ll definitely be trying it out this summer! 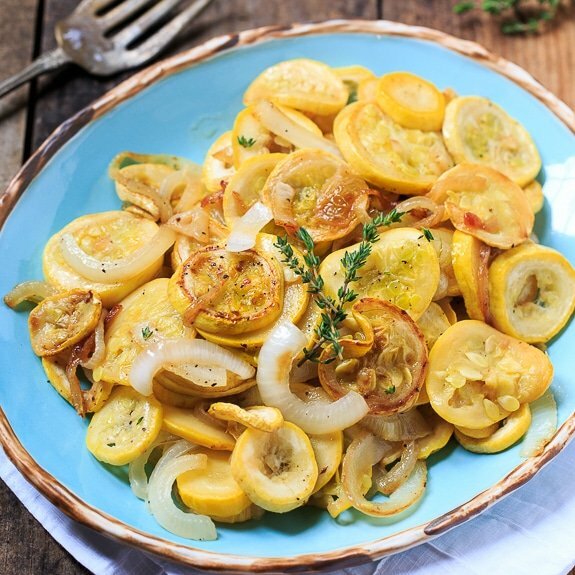 Delicious summer squash and onion stirfry.. Love how easy it is to make.. Perfect summer side dish! So simple and delicious. Must try this weekend.